The Chicago Area Peace Corps Association (CAPCA) in conjunction with the NPCA will hold the four-day conference from August 5 to 8, 2004. The conference theme is "Peace Corps 2004: Celebrating a Legacy of Service". The event will be held at the historic Palmer House Hilton Hotel conveniently located in the heart of downtown Chicago. 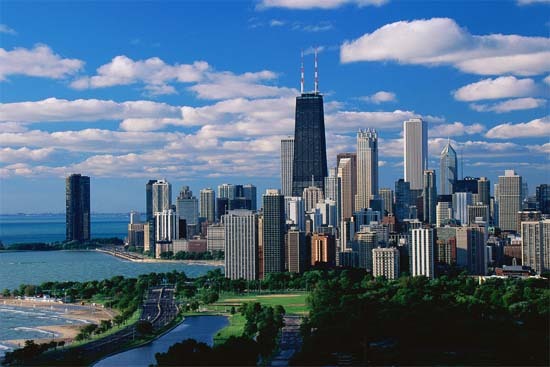 Some events will be held in Chicago's great outdoor parks along Lake Michigan - Grant Park and the new Millennium Park. In keeping with the theme, leaders in peace and advocacy will speak and awards of recognition will be presented to strong legacies within the Peace Corps family. Workshops offered during the conference will cover a variety of topics, including: international affairs, stateside advocacy of international projects, Peace Corps global education and international business practices. Country of service activities will be held throughout the weekend. Conference participants will have the opportunity to work as volunteers in the Chicago area or promote peace and Peace Corps awareness through a 5K Fun Walk/Run. Attendees are also encouraged to attend the International Marketplace, an event encouraging artisans in Chicago and around the nation to exhibit their wares, and the Career Fair, bringing together corporations, NGOs and universities interested in returned Peace Corp volunteers and staff with international backgrounds. Note: There is only one meeting of the President's Forum in the draft schedule - a two hour session on Saturday, August 7 from 930 to 1130. At the Annual Meeting at Portland a few months ago, there were two sessions of the President's Forum - two hours on Saturday and one additional hour on Sunday to take care of unfinished business from the first day. Check this site periodically to find out what your country of service group is planning during the 2004 NPCA Conference. If there is no event listed, check with your group's leader for details. A 3 hour advocacy session, where are safety,secuirty, health care, attrition rates and the real problems of returned volunteer will be chatted about and nothing will be done anyway. 3 Hours, What a joke. I won't waste my money coming to that kind of hub bub. Nothing will be done to change the above crisis at Peace Corps because apathy reigns true and most of the NPCA are sycophants to any current administration. When you are chomping on your chicago Pizza know that 31 Volunteers have been killed, died or are missing since 1996. 2000 plus victims of violence since the early nineties that Peace Corps doesn't really recognize or help volunteers who have had problems from these situations. I bet you will discuss FECA benefits that will go on for hours until the sessions over. That is when Vassquez's administration wipes their forehead and say "OK we are out of here". Nothing will be done. I hope you discuss us. Remember we are not there. We won't be there for a reason. Quigley, you don't do anything. Why don't you rub Vassquez's back while you are there. Where is safety on the agenda? Where are attrition rate problems? Where are problems with FECA? Where is the Agenda for a Lawyer working for Volunteers? Note: 31 Volunteers killed, died or missing since 1997. 2000 Plus volunteers victims of violence and they have no rights. Remember we are watching your apathy.